Barcelona. Oh, goodness me, Barcelona. I'm still not quite sure what hit me. I'm still reeling, dizzily, after my extended visit to the city. A certain Icelandic volcano extended my stay in the Catalan capital, for which I am grateful. Not a bad place to be stuck in a four star hotel. I finally returned home late last night, six days late, after a stop in Prague to speak at the National Cycle Conference about Cycle Chic and marketing bicycle culture. But Barcelona. What has happened to this city with regards to the bicycle returning - stylishly and effortlessly - to the urban landscape is extraordinary. Ten years ago there were none. Five years ago there were some. 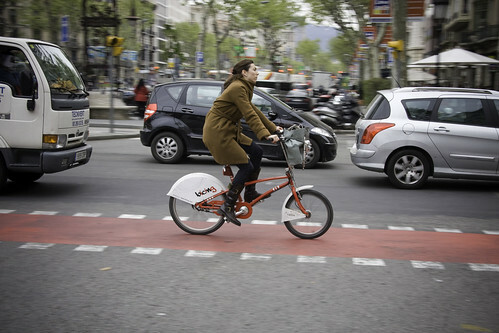 Now the bicycle is everywhere, not least thanks to the implementation of the city's Bicing bike share system. But while you see Barcelonans of all ages on Bicing bikes at all hours, the city is completely saturated by private bicycles. 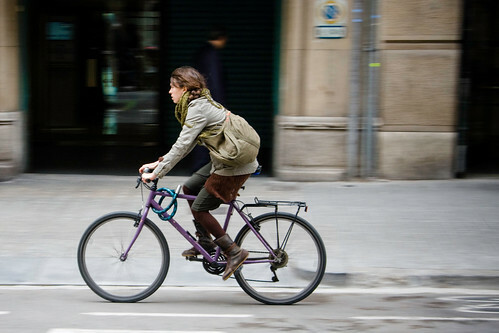 I fear I must revise the Cycle Chic Top 5 Cycle Cities list and cast Barcelona headlong into the mid-table. Bicycles abound in the city. In the narrow neighbourhood streets, along the busy throughfares, outside cafés and shops, soaking up sun on balconies. Being stuck in a such a bicycle capital certainly meant that I missed Copenhagen so much less. Many more photos to come. You have to see this cycling city. BCN is such a cool city to live in, tout à fait!! Their Bicing bikes look so nice! I have been there a few times and never noticed many bikes around. I will have to go back and marvel at the newly budded cycle chic there! Isn't it great!! You wonder what happened to Barcelona. I told you.. something magic that you could not miss!! The only way to see Barcelona is by bicycle!! If anyone is on their way, don't miss Los Caracoles Restaurant, it's wonderful! So how is Prague as a biking city? Maybe I'll get to bring my two wheels their too! Seriously, where are the guys in your pics??? One possible reason why cycling has boomed in Barcelona in the past 10 years might be that anarchy/anarchism is very deep, very strong in the Catalan blood (read about events in Barcelona and Catalonia from 1900 to 1939 to see what I'm getting at). For a new generation, cycling - 'anarchy without malice' - may be the sanest way to recover independence, autonomy, fun, a sense of community, a sense of greater fairness. The style doesn't hurt, though it surely raises eyebrows in the more conservative parts of Spain, where memories are long.